In Columbus, Ohio on the Ohio State University campus, there is a building that does not stand out much. It is tan, small, and has dark windows facing the street. The parking lot is for Ohio State faculty and students only, and looks too big for the building. This peculiar structure is the Museum of Biological Diversity. Walking in through the heavy doors, there is a conference room to the left, usually with people who will glance up at visitors and then back to their business. The smell of preserved life infiltrates the nose and sinks its way into clothes. It is not a bad smell, just… different. Continuing through the second set of doors there is a hallway. This hallway does not seem to fit the outside appearance of the building. It is like that long hallway that never ends in dreams, only this time it does end. Walking down the hallway there are posters of research and multi square pictures of insects, spiders, plants, and more. To the right are huge metal lockers that continue down the large part of the room. Three pronged wheels allow the technicians to move the lockers forwards or backward. This contraption allows room to open doors and pull out the drawers of insects. The lockers are marked with labels such as Odonata, Hymenoptera, and Coleoptera amongst the many yellow sticky notes. 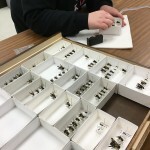 Over the Fall 2015 co-op internship, it was my responsibility to learn how to set up and maintain an insect collection. I worked over the summer to begin a collection of the biodiversity sample of bees that is was in need to be pinned, identified, and stored. 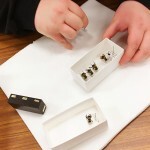 At the Triplehorn Insect Collection I was shown how to pin the collected specimens to museum standards and how to store them. No one there has great experience in identifying bees, but I am working my way through two resources that break down how to determine the genus of a bee. 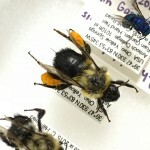 I worked my way thought The Bee Genera of North America, only to find it too difficult for an amateur like me. 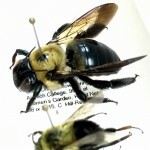 However, Lu helped me pull out specimens that looked similar to the bee pictured above (Figure 3). After I determined the specimen to the genus Melissodes, I worked backwards through the book. I then reached out the well-known bee expert, Sam Droege. Dr. Droege gave me many tips on identification and great resources that I have been reading. He said to start on already identified bees, so that I could hone my skills. I hope to someday work by his side and learn all he has to offer. 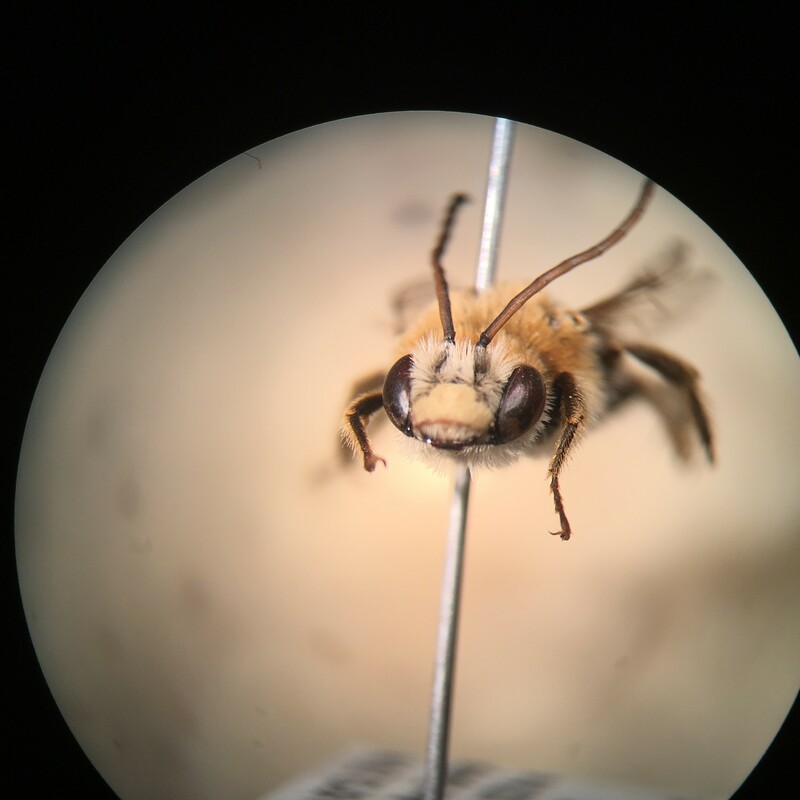 Along with the work involved with the bees, I have been learning other tasks that go along with management of museum grade research specimens. I have learned how to create labels and what data needs to be on them, how to barcode, and how to input the label data and barcode information onto an Excel spreadsheet. I have also learned how to DEA, which is an online device that checks all the excel sheets and puts the information in the correct format. Its not difficult, but it is critical to pay attention to everything being done since the information will be available online for researchers to find. I have moved specimens from cork bottoms that trap old specimens and make it hard for researches to handle without breaking the insects, to hard foam bottom unit trays that help organize the 4 million individual insects that are in the collection. 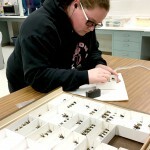 Cherokee working on her bees at the Triplehorn Insect Collection and some of the beautiful results of her labor. During this work I have learned what materials I would need to start up and maintain an insect collection. Some items include pricey cabinets sealed with silicone foam so that nothing gets in the cases, drawers that have glass tops and fit into the cabinets, unit trays, and small glue boards that will hold broken pieces of specimens. 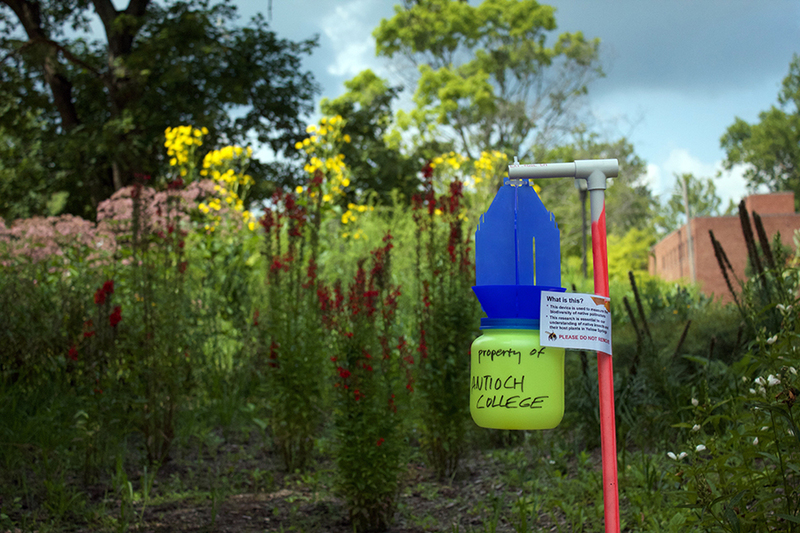 There is a whole laundry list of things needed for a task like this to be started, but thankfully the Triplehorn Insect Collection and Doctor Luciana Musetti have agreed to help Antioch College with small items – like the barcodes and the label paper. While it might not seem like much, it is actually very helpful for Antioch and a great honor. 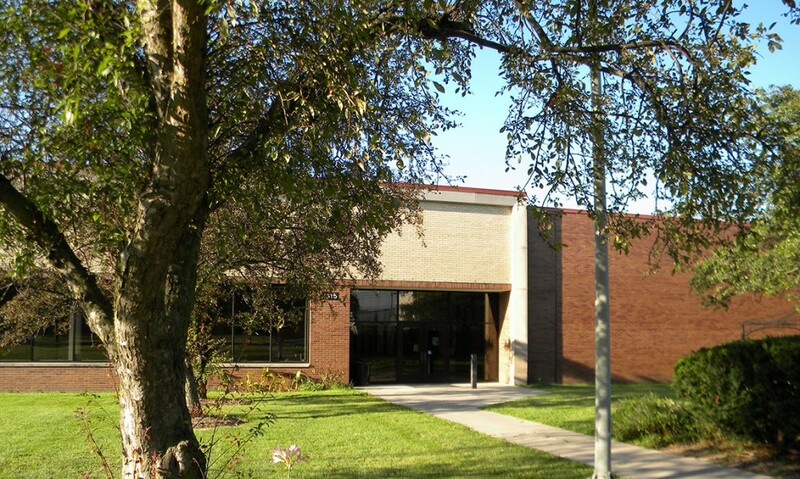 I hope to work on building a small insect collection at Antioch College. 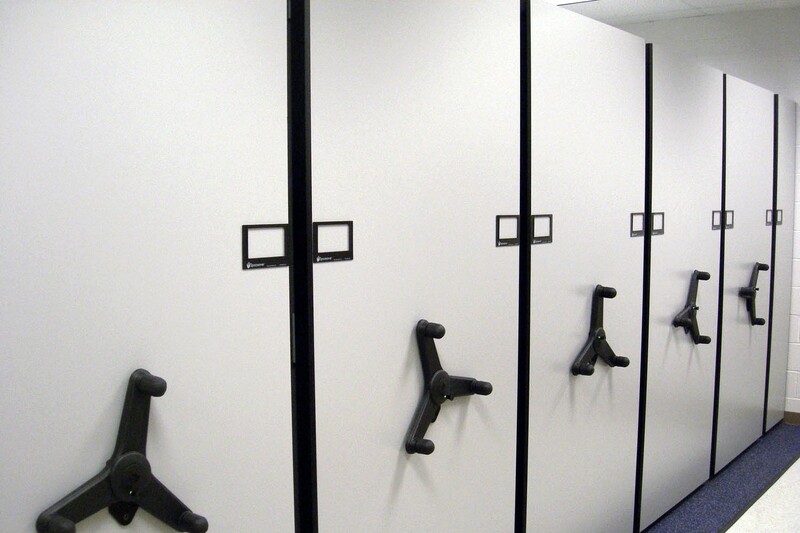 It will be mostly collected specimens from biodiversity samples. 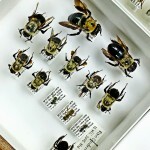 Currently the bees that were caught have been pinned using size 2 and size 0 pins. The bees large enough to be pinned with the size 2, have been spread while the smaller species have been point-mounted, meaning they have been glued to a small triangle on the size 0 pin. Further work is needed to determine the species down to genus. Working on this internship, I have found a place I call a second home. I could spend hours (possibly days) in the quiet environment. Coming home smelling like naphthalene, the substance mothballs are generally made of, I feel peaceful. It is a great workplace and I would recommend this co-op internship to anyone interested in highly detailed work that can take days to finish, a quiet but friendly workplace, and a love for insects. About the Author: Cherokee Hill-Read is an Environmental Science Major at Antioch College in Yellow Springs, Ohio. She is passionate about entomology and wants to pursue a higher degree in the field. 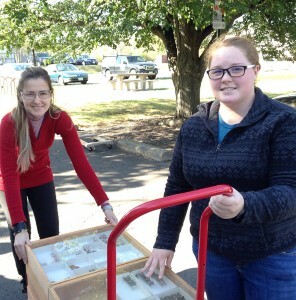 As a part of her academic Cooperative Education Program at Antioch, Cherokee spent three months (October 17 to December 17) at the Triplehorn Insect Collection as a Curatorial Intern, or as she calls it, “my co-op.” She wrote this post as a wrap-up of her activities here. She did not mention that her photo appeared on an article on the Columbus Dispatch and on another post in this very blog. Cherokee made huge progress in the short period of time she’s been with us and she’s one of our team now. Posted by OSUC Curator at 1:00am December 17, 2015 Posted in Curation, Education and tagged curatorial assistant, internship, training, undergraduate. Bookmark the permalink. It was great to have you as part of our family. You’re always welcome back, although we may sit you down at one of those computers!